I've posted about this before. I still wonder about getting one, even though I know that I have no real use for it at all. The Z88 was designed by Clive Sinclair in 1987, and closely resembles a ZX spectrum. 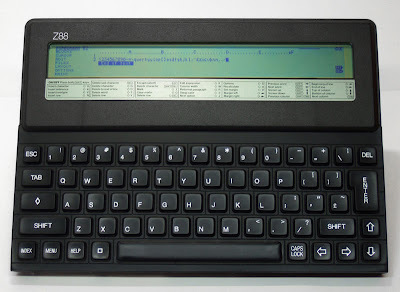 It had a built in word processor / spreadsheet / database on board. How cool is that then? Any guess for what this is? Emulators, are they worth it?